Special deals for some tours booked with accommodation. Save money on your tours and accommodation by booking one of the packages. Please note - deal prices only available if booked as a package (ie. not rooms and tours separately) and also booked before arrival online. This package includes 2 nights at Sarah GH and a one day cookery course. 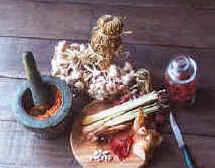 Includes 1 day Thai cookery + 2 nts accom. This package includes 2 nights at Sarah GH and a one day adventure trek. Includes 1 day adventure trek + 2 nts accom. 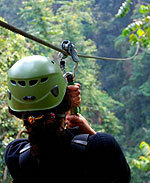 This package includes 2 nights at Sarah GH and a Flight of the Gibbon Adventure. Day 2 One day trip to the jungle with Flight of the Gibbon, jungle sling from 39 stations/platforms and hike to waterfall. Departure time according to availability. Earliest is 0630 and latest midday. 10.15 – Arrive at Gibbon Adventure Base / Welcome & Introduction. 10.30 – Put on safety gear / Go to starting point / Full Safety Briefing. 10.45 – Start the Adventure, 39 stations of high-flying fun. 14.00 – Canopy Adventure finishes / Eat lunch. 15.00 – Jungle trek to Mae Kompong waterfall. 16.00 – Program Wrap-up / Board vans and transfer back. 17.00 – Arrive back in Chiang Mai. Times vary according to pick up time. Includes 1 day Flight of Gibbon adventure + 2 nts accom. This package includes 2 nights at Sarah GH and a three day trek. Day 2 One day elephant mahout course driving north of Chiang Mai to the elephants home. Then learn about the elephants and how to be a mahout. Practice skills on a 1hr elephant ride, then feed and bathe the elephants. Lunch provided. 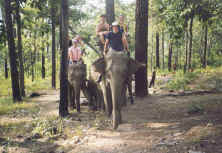 0830 to approx 5pm Includes bathing elephants, feeding elephants, riding elephants & learning mahout skills. 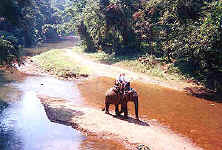 Includes 1 day Mahout course + 2 nts accom. Day 2 Itinerary for 2 day trek = (0930)Drive north of Chiang Mai (approx 1hr) , stopping at a local market on the way. Drive a further 1 1/2 hrs to an Akha village where we stop for lunch. 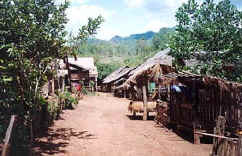 In the afternoon we walk 3 hours to a Lahu village and stop for the night. Includes 2 day trek + 2 nts accom. This package includes 3 nights at Sarah GH, a one day trek & a Thai cookery course. 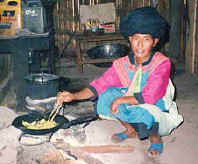 This package includes 3 nights at Sarah GH , a 1 day cookery course and a 1 day tour to the Golden Triangle. Includes 1 day Golden Triangle trip, 1 day Thai cookery course + 3 nts accom.